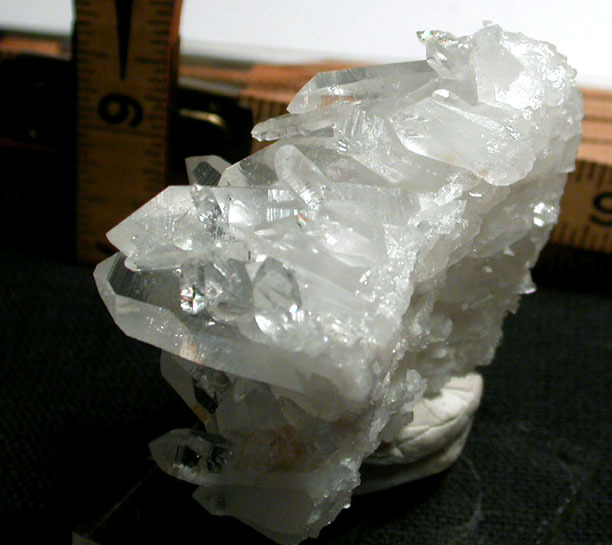 Bright, energizing, inspiring - and a great study cluster, this Arkansas rock crystal 'family' can teach you many different crystal types, show you clarity, rainbows and plenty of them, veils and re-termination, and all comfortably curved in the palm of your hand. There are a little true diamond window, uncommon 7h faces, rare 6-edged shield faces, 7- and uncommon 8-edged channel faces, Isis and split faces...tabular crystals, chisel crystals, penetrated crystals and twins. Record keepers. Enhance your collection or start someone else's! 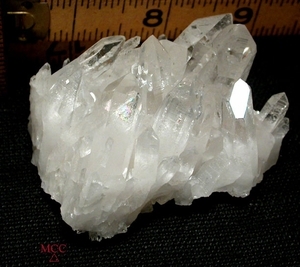 1-7/8x 2-1/2x 1-3/4" tall from Montgomery County, Arkansas.